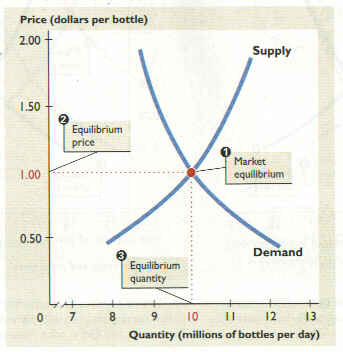 The law of supply and demand states that prices in a free market economy will tend to rise or fall based on the relationship between the supply of goods and services and the demand for them. What makes a market economy interesting is that the economic pressure of increased demand stimulates suppliers to increase their output of goods and services. Initially, this increased output results in proportionally higher sales at the current price. As demand is satisfied, however, price tends to fall. While buyers wish to pay as low a price as possible, sellers wish to charge as high a price as possible. When supply is stable, price quickly reaches an equilibrium where bids and offers match. This page was last modified on 26 September 2018, at 13:04.